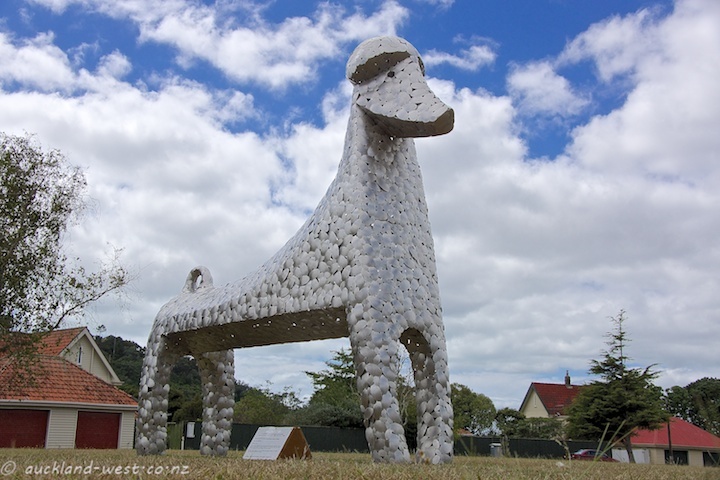 Steve Woodward‘s dog “Kuri Topiary” seems to have escaped into the open spaces at Hobsonville Point. 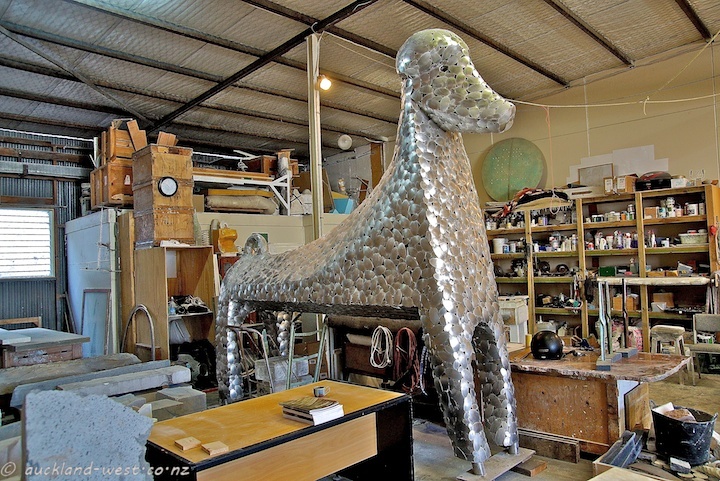 Last time I saw the 3 meter high sculpture, it was garaged in Steve’s large sculpting shed. 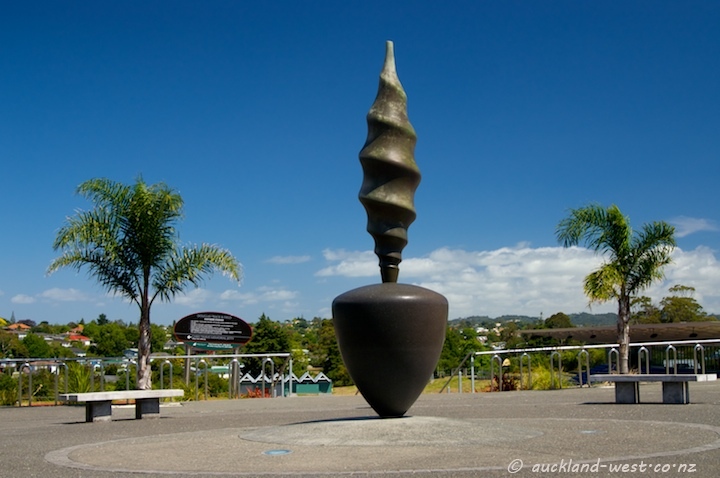 On the way to Hobsonville Market and Hobsonville Point Wharf. Kuri is the maori word for dog, and the topiary part obviously refers to the leafy structures that were formed into the shape of a dog. 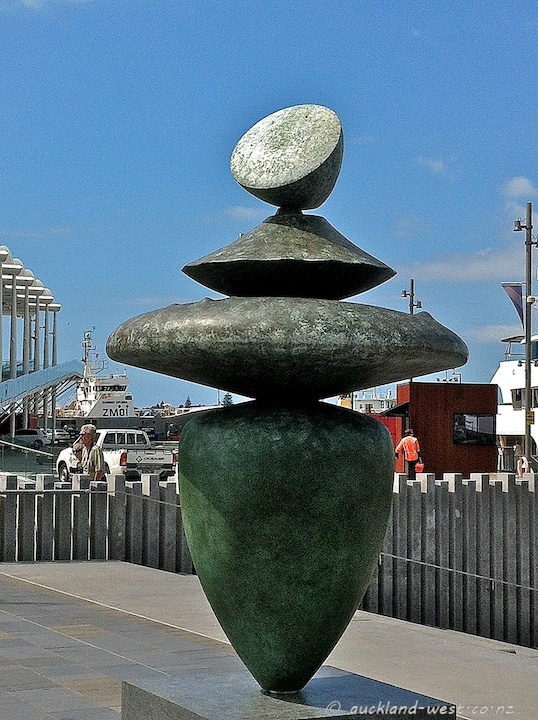 Presently on display at the Karanga Plaza, Wynyard Quarter, as part of the Summer of Sculpture. Bronze, stainless steel bearing system, granite base. Contact: (09) 827 1438 or mobile +64 21 256 5117. And, yes, it does spin — give it a whirl! We have shown other work by Steve Woodward on this blog before. Last weekend over 200 artists in the West opened their doors to connect with the public during the West Artists’ Open Studio Weekend. 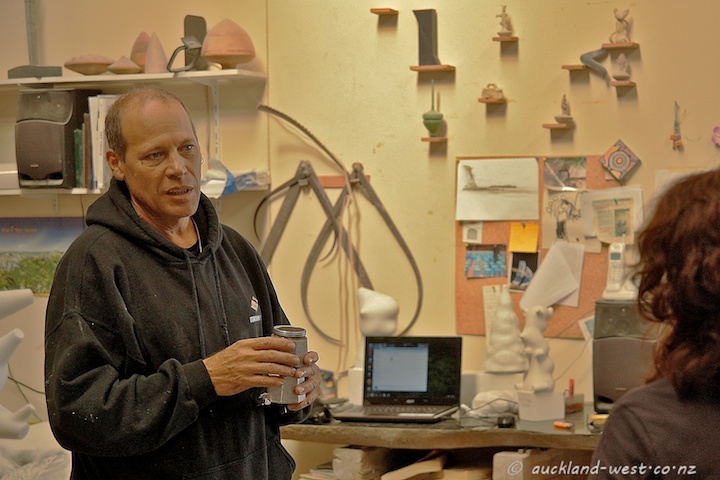 I grabbed the opportunity to visit Steve Woodward whose work featured on this blog on a number of occasions (Stand Turn Spin, Waituarangi Bridge, Step Touch Stone, Whau Pod). 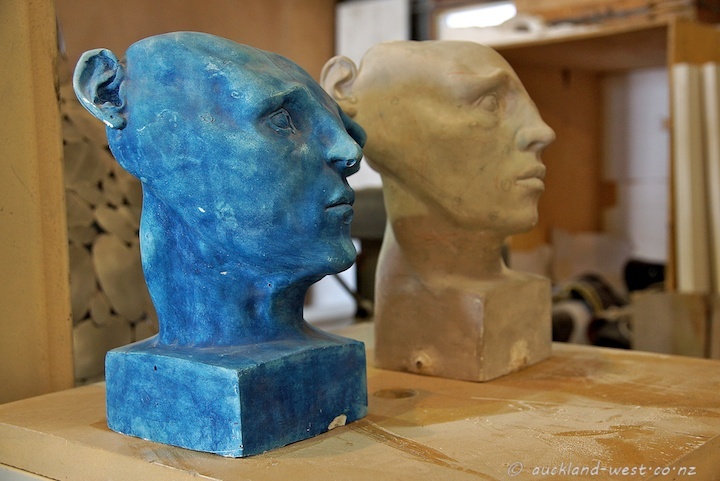 Once I had found his studio (in amongst a cluster of warehouses), it was interesting to hear about his work and how he developed his craft working for Italian and French sculptors. 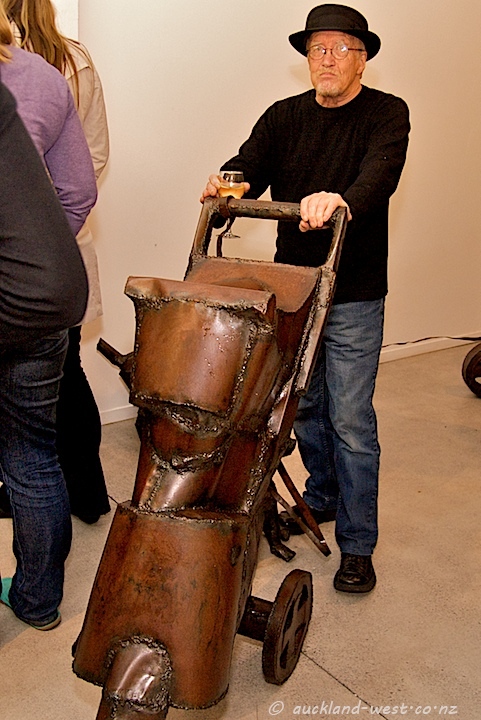 Steve is an internationally recognized artist, with work in public and private collections here and in Australia, Canada, China, France, Italy, Japan, Taiwan, Thailand. A picture by Nguyễn văn Tuấn of Kuri Topiary roaming the Botanic Gardens is here. Steve Woodward, 10 Portage Road, New Lynn, ph +64 9 849 6501. 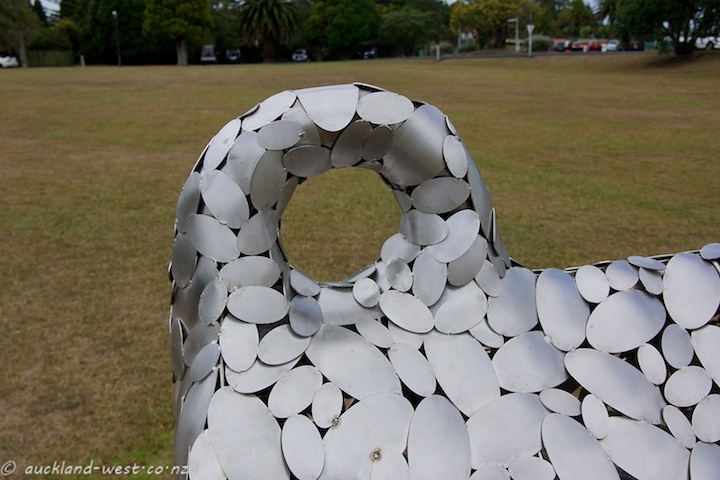 Olympic Park in New Lynn (map) is home to a good number of works by Steve Woodward. 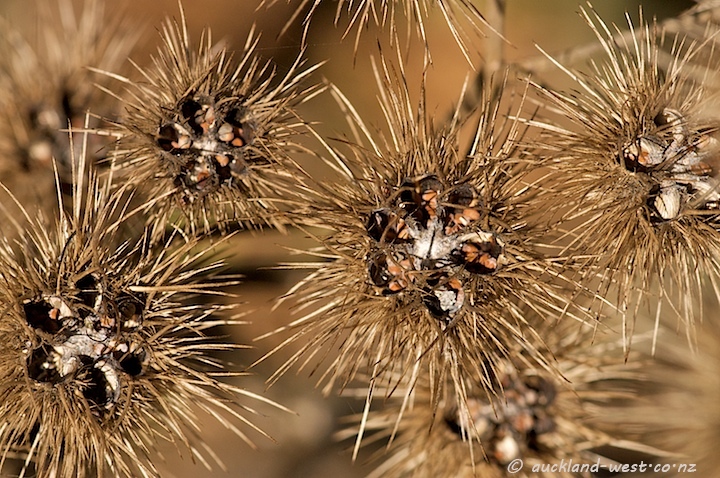 This one is entitled Whau Pod, and if one thinks of these pods in terms of yesterday’s post (I certainly would), then one might well mutter about artistic licence and such like. 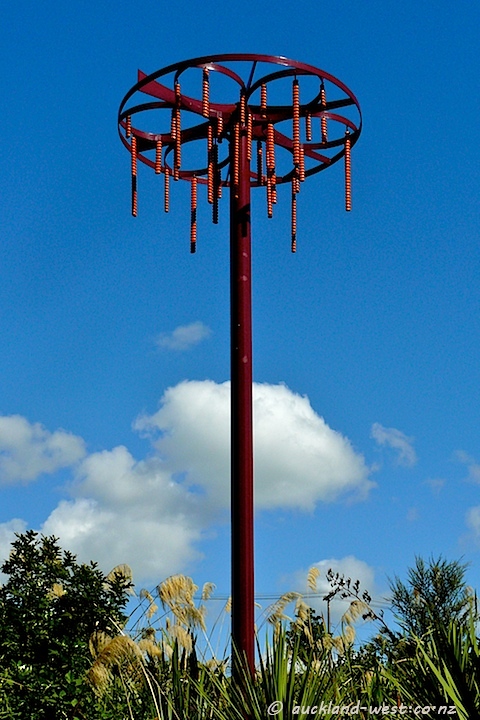 However, the answer lies in looking at the pods after they have fully ripened, as in the picture below: one can clearly see the six chambers, filled with seeds of some pinkish coloration – the sculpture depicts their falling out of the pod. One of the streams bordering Olympic Park is the Whau Stream. 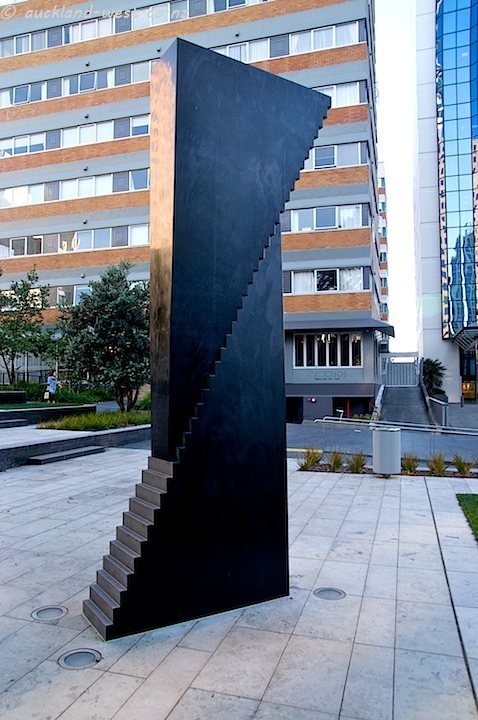 This sculpture, made from Shanxi black granite, stands in St Patrick’s Square in the City. 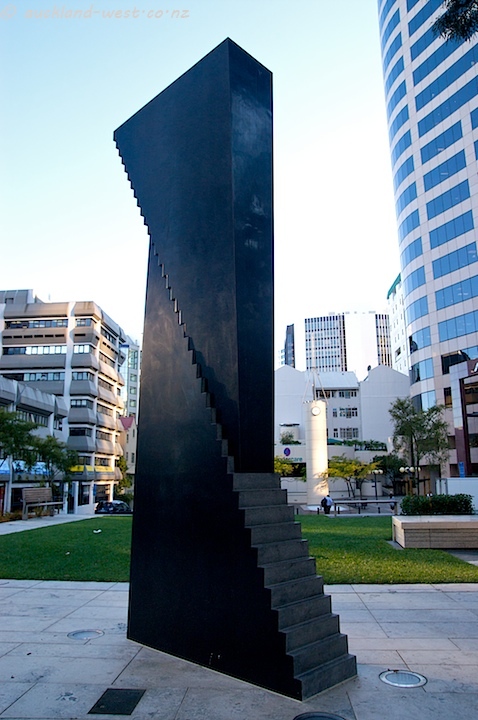 The artwork was commissioned by the city in the course of the refurbishment of this public space (officially opened October 2009). We have shown other works of Steve Woodward, and more will follow. See a picture of Steve Woodward at work on this project. Lachezar has a splendid picture of St Patrick’s Cathedral and the top of the square. 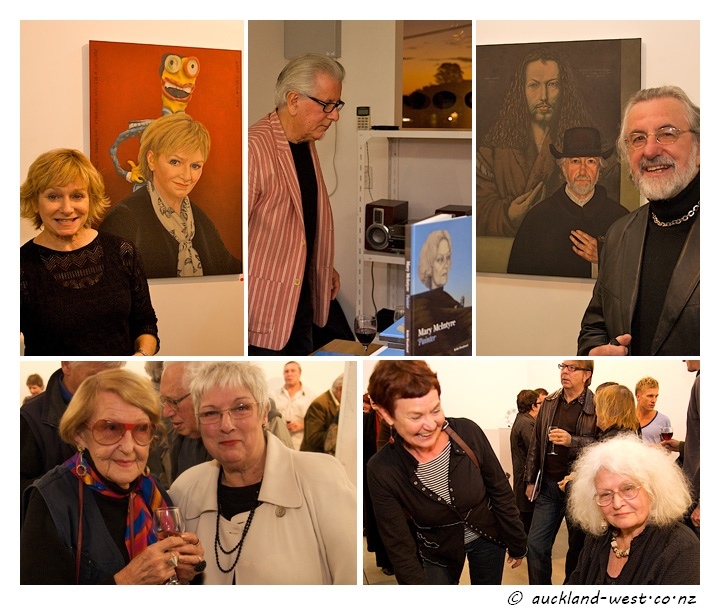 On Tuesday evening, Whitespace Contemporary Art hosted the launch of Robin Woodward‘s book “Mary McIntyre – Painter”. The evening marked also the opening of an exhibition of work by Mary McIntyre, as well as an exhibition of pieces by metal artist Greer Twiss. This is a subjective and incomplete selection of impressions of the evening. In the top row we see Gallery director Deborah White in front of Mary’s painting “Deborah Whitespace”, then gallery co-director Kenneth Johnson and the book, and art critic TJ McNamara in front of his portrait. The second row shows (left to right) painter Jan Nigro with Rita Webster, and Herta with Mary McIntyre at the signing of the book. The book by Robin Woodward is published by Whitespace, Auckland, May 2010. Mary McIntyre is represented by Deborah White of Whitespace. Robin Woodward is also the author of the book “Steve Woodward” (the sculptor who featured a number of times on this blog – no relation of hers), also published by Whitespace. 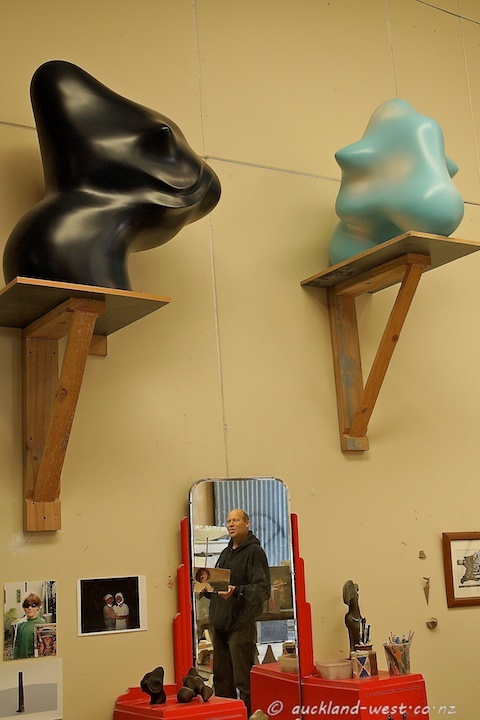 Greer Twiss was kind enough to pose with one of his larger works – the dog that goes with it is obscured. 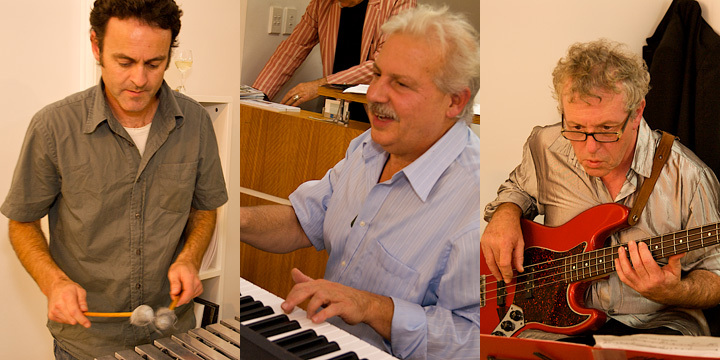 Live musical entertainment was provided by Jonathan Besser (keyboard), with John Bell (vibraphone) and Peter Scott (bass). 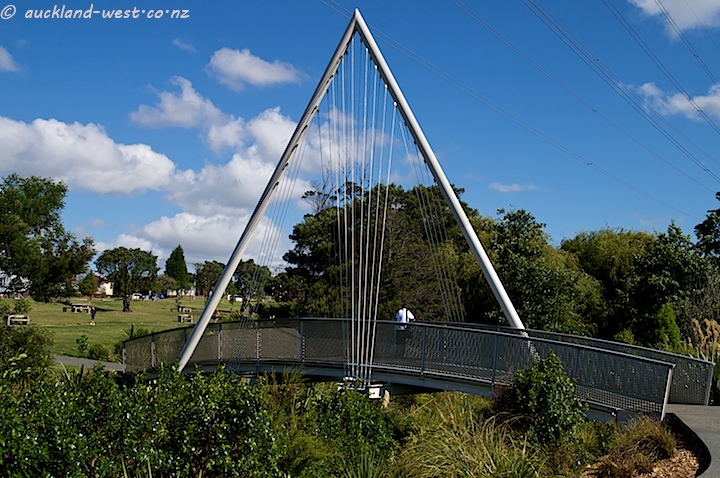 This elegant bridge over the Avondale Stream (Wai Tahurangi) in Olympic Park was engineered by URS Corporation on the basis of the artistic vision of local sculptor Steve Woodward. 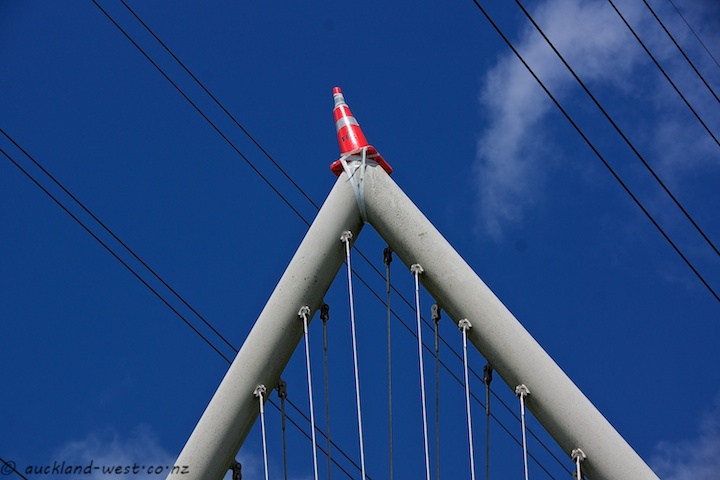 Putting it in place under the high tension wires was a challenge, described in a press release by URS. 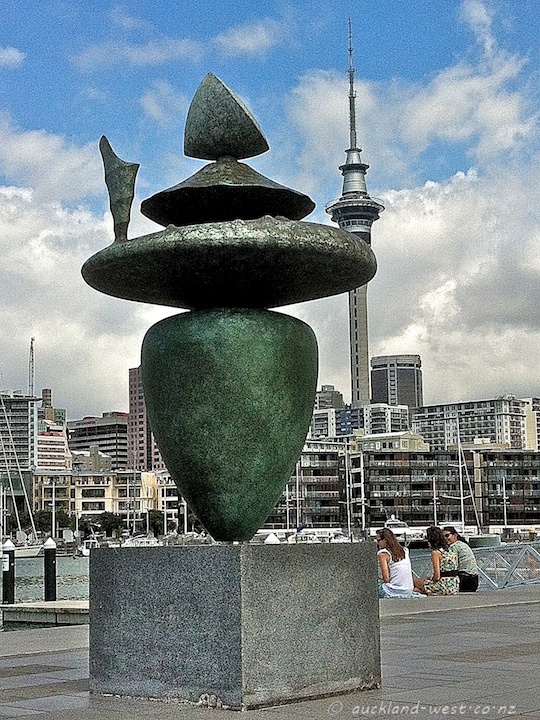 “The sculpture is mounted on a hidden bearings system, enabling people to, with moderate effort, turn the ‘top’.” (From notes at http://stephen.woodward.free.fr/spin.swf.) Of course, I had to try it, and indeed it turns, the effort being commensurate with the significant mass of the piece.